Willis Tower: Stand on The Ledge of the iconic skyscraper and peer down at streets and buildings in the Chicago Loop (while remaining calm). This 1973 landmark put the city in an uproar when insurance broker Willis Group Holdings Ltd acquired the Sears Tower naming rights in 2009. That doesn't change the fact that the building occupies two city blocks and stretches 1,454 feet high, making it the second tallest building in the U.S. 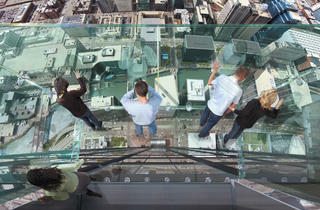 If you're looking to see more of Chicago than you'd be able to take in on a walking tour, the Skydeck is your best bet. Views from the 103rd floor are expansive, allowing guests to see up to four states and 50 miles out. While you’re up there, learn about the city’s landmarks from a multilingual computer program and about its history from wall exhibits. The best times to visit are just after opening and at sunset, when you'll be able to look out at the glassy skyscrapers' sparkly lights against the night sky. 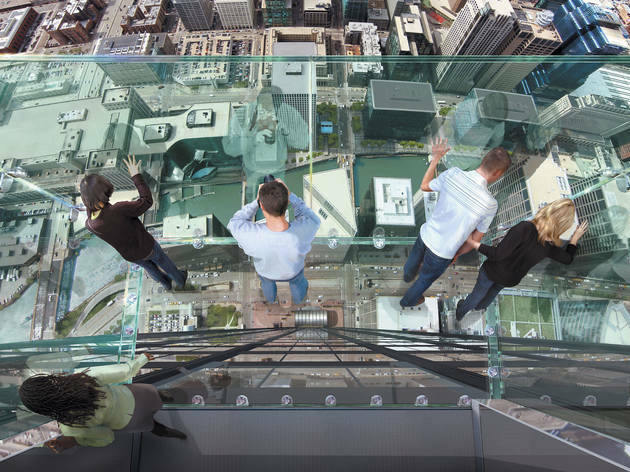 Of course, if you've made it this far, you might as well experience the Skydeck's main attraction, the Ledge. Glass boxes hang out over the building's 103rd floor, offering a slightly terrifying experience and even better views from 1,353 feet off the ground. It's a thrilling experience that will delight the tourists and out-of-town parents and kiddos in your group. For visiting romantics, the Skydeck offers a convenient date night options. Located walking distance from Union Station and Ogilvie Transportation Center, the attraction stays open until 8pm October through February and until 10pm March through September. Check out the stars and snap a photo with the skyline before heading out to a nearby neighborhood for dinner. Our Chicago editorial team is constantly updating and reviewing the best attractions, activities and venues across the city, so that you're always in the know, with the best of Chicago at your fingertips. Chicago was most recently updated with new tips on June 30, 2017. El stop: Brown, Orange, Pink, Purple (rush hrs) to Quincy. Bus: 126, 151, 156. Visiting the Skydeck in the Willis Tower is a MUST do while you're in Chicago. The views are amazing and I was even able to brave my fear of heights to go out on the ledge. Get your picture there looking down! It's a view you won't get anywhere else! The Willis Tower has a short movie to watch before taking the elevator to the top floor. It is really interesting and gives a good history lesson about the former Sears Tower. That's so exciting! Glass boxes hang out over the building's 103rd floor and you like an ant - it takes your breath away! I will https://writemyessayonline.com/ write my essay about the Tower. The views from 1,353 feet off the ground are so beautiful, this is one of my favorite places!